Maybe you are able to present a photo of their hands? I will try...I posted photos many years ago on a palmistry message board but I cant seem to find it, The twins are much bigger and stronger now and having their hands messed with is not something they like, but Ill try....I once read that when a couple both have a sydney line they are apt to have twins, This is true for me and my husband, and was for my friend and her spouse ...But we both have children on the autism spectrum .Her children have fragile x...Have you done any study on parents hands that have had twins? cnriley45 wrote: I will try...I posted photos many years ago on a palmistry message board but I cant seem to find it, The twins are much bigger and stronger now and having their hands messed with is not something they like, but Ill try....I once read that when a couple both have a sydney line they are apt to have twins, This is true for me and my husband, and was for my friend and her spouse ...But we both have children on the autism spectrum .Her children have fragile x...Have you done any study on parents hands that have had twins? Aha, nice to hear from you again! Yes I remember - you reported back than that that you & your friend together have has a lot of fragile-x children and I think you also shared some visual materials. Unfortunately, the other forum got lost completely after the manager zapped everything into space (for unknown reasons). After this actually happened a few times in a row during a short period of time, I decided to start this forum! 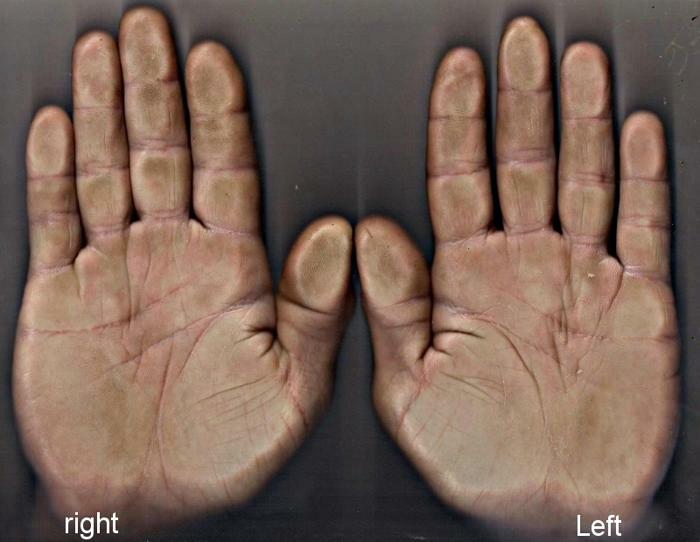 Well, the 2 cases that I present on my website indeed do have some of the other physical characteristics (though I have not much details available regarding body markers beyond their hands). But this may not be the case in every case of fragile x-syndrome. Anyway, I think if the genetic testing is a positive then it doesn't matter if most typical characteristics are missing. Yes, in autism a low 2D:4D digit ratio (short index finger versus ring finger) is a common feature; However, unfortunately it appears that so far there has not been any 2D:4D digit ratio study focussed on fragile-x syndrome. But in the 2 cases that I have assessed by detail the index fingers can not be described as short, nor is there evidence of a clearly low 2D:4D digit ratio. So, I think it remains so far unclear whether short index fingers in Fragile-X people have likewise significance as short index fingers in autism; still, it is an interesting option to keep in mind... but so far there is no solid evidence at all. I remember you posting in the previous palmistry group, about your twins, autism, fragile x etc. Welcome! That could be a clue, especially if the physical development of your youngest son is not really different from the autistic boys. Thanks. I have been thinking about Fragile-x syndrome at little more, and I just became aware that it is also about twice more prevalent among boys (compared to girls). I think this raises the chances that in Fragile-x syndrome the 2d:4d digit ratio is typically smaller than in family members - though I think there is no research available at all. 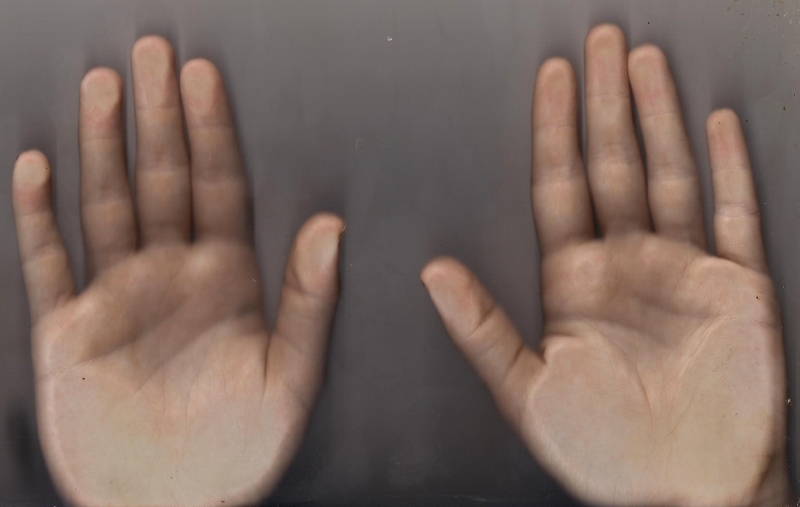 By the way, 2d:4d digit ratio requires a measurement from the creases (separating the fingers from the palm). It would be slightly abnormal if all your non autistic boys would have a 2d:4d digit ratio higher than 1.00. Anyway, your descriptions sounds quite like their finger proportions are quite different from the autistic boys. Thanks for the scan of your other boy. His digit ratio is indeed much higher (close to 0.93) than the Fragile-x autistic boys, however for a white american boy it is actually (also) below average. Anyway, this confirms your observation that your non-Fragile-x son non-autistic son does appear to have a much higher 2d:4d digit ratio than your other sons... at least regarding the right hand (in one of the Fragile-x autistic boys the left hand appears to ;have a high 2d:4d digit ratio, see the observation that I shared inside the other discussion). Interesting, as this is the very first evidence that I have seen which points in the direction that Fragile-x syndrome (just like autism) is likely indeed featured with a low 2d:4d digit ratio (compared to family members). This evidence would become stronger if the father of the Fragile-x boys also has a digit ratio that is clearly higher than the digit ratio seen in the Fragile-x boys. PS. Also, interesting to see that the pinky finger & head lines appear to be ordinary in the non-Fragile-x boy non-autistic boy. Aha, sorry... then I did not process your info correctly (but now I do understand that only the kids of your moved friend have Fragile-x syndrome). I have corrected my previous posts in this topic in response! PS. According my experience Fragile-x syndrome is much more easy to assess from then hand than autism, though one can expect a considerable overlap regarding the hand characteristics seen in both disorders (especially when autism is combined with a mental handicap). Would be interesting to hear of your autistic boys have these characteristics? By the way, 'tactile defensiveness', 'hand biting', 'hand flapping', 'simian/Sydney line', and a 'high axial triradius' are other hand features that are mentioned inside the article. I expect to update my Fragile-x article with at least 2 new hand features in the near future.